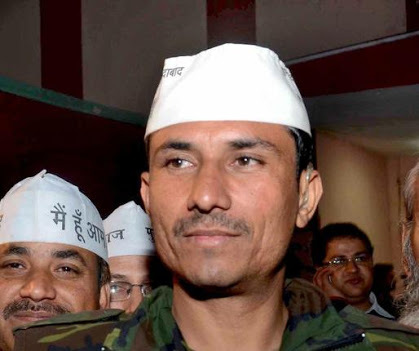 New Delhi : The MLA of chief minister of Delhi Arvind Kejriwal's Aam Aadmi Party, Commando Surinder Singh, got into an argument with municipality employees who were clearing the Race Course Road pavement of unauthorized vendors on Tuesday evening and allegedly beat up one of them. Sanitary inspector Ram Jeevan Meena, who was leading the NDMC team, claimed that the former Army commando also made castiest remarks. An FIR has been registered under the SC/ST act on the basis of a complaint by one of the employees. Singh was interrogated for three hours over the incident on Wednesday before being let off. Speaking to TOI, Singh said he lost his cool when a vendor told him that the NDMC men were demanding a bribe of Rs 3,000 for letting him off. "I did not beat up anybody nor did I abuse," he said. Meena, leading the 10-member NDMC team, said the incident took place around 6pm. The men were from the health enforcement unit and had found unauthorized vendors outside the Race Course Road Metro station. They were caught and their wares taken away. However, a vegetable vendor later identified as Rinku tried to flee, Meena said. The officials chased Rinku and caught him at a traffic signal. Meena said Rinku was found to have no licence and his motor-rickshaw was being hauled into an NDMC truck when the MLA, who was passing by in his Mahindra Scorpio, stopped and asked them what was going on. After being told about the drive, Meena said Singh grew angry and asked the NDMC men to stop hauling the vehicle. A NDMC worker, Mukesh Kumar, protested but Singh's driver stepped out and intervened. An argument broke out during which Mukesh was beaten up by Surinder and his driver, Meena said in his complaint. Surinder left after this threatening them with dire consequences if they harassed illegal vendors unnecessarily. Meena accused Singh of hurling castiest abuses. "He said, 'tum log bhangi ho, safai to karte nahi ho, rickshaw-rehdi ke peeche bhagte ho aur unhe tang karte ho... mein tumhara naukri kharab kar dunga' (you people are from the scavenger caste, instead of cleaning up the place, you run after vendors and harass them. I will get you sacked)," claimed Meena. Following the incident, NDMC workers registered a complaint at the Tughlaq Road police station. Mukesh was admitted to RML hospital with injuries on his head and face. He was treated and let off by the doctors on Wednesday morning. Police said that a FIR under section 332 IPC (voluntarily causing hurt to deter public servant from his duty), 186 IPC (obstructing public servant in discharge of public functions), 353 IPC (assault or criminal force to deter public servant from discharge of his duty) and under sections of the SC/ST Act. The MLA, however, denied the charges. He said he was returning from the assembly session and had stopped after seeing a vendor pleading with the NDMC men for his cart to be released. "At the Race Course Road traffic light, 10-12 men were dragging the vendor towards a truck. Initially, I thought it was road rage. But the men told me they were from NDMC. I asked them to deal with the situation legally instead of creating a ruckus on the road. I got upset when the vendor told me they were demanding Rs 3,000 to release the cart. I called up the NDMC chairman and informed him about this," Singh said. "After this, the men accused me of abusing them. There was no fight. It's all a political vendetta," he added.